Everyone loves a festival but bring two of the biggest food festivals in Port Stephens together and you have a recipe for a salivating month-long event. The renowned Port Stephens events, Love Seafood and Tastes at the Bay have joined forces and resources to create one of the biggest events on the Winter Calendar in Port Stephens. Love Sea Food has become a highly successful event held in the month of August celebrating one of the great attractions and drawcards Port Stephens has to offer, fresh local Seafood. The long-standing Tomaree Business Chamber event, Tastes at the Bay, traditionally held annually in November will now become a highlight of the Love Sea Food event program. This year we expect yet again to grow visitor numbers and by bringing both events together provides an exciting opportunity to create a bigger and better event in 2019 and beyond. The event aims to drive economic benefit across the Port Stephens region during our lower visitation time of year. Running from 1 August to 1 September 2019, Love Sea Food Tastes Port Stephens event program will be expanded offering a range of special dining experiences and activities each week. Highlights of the month-long program will be the Love Sea Food Gala Dinner on Saturday, 3 August 2019 and the Tastes Port Stephens festival weekend on 31 August and 1 September 2019. 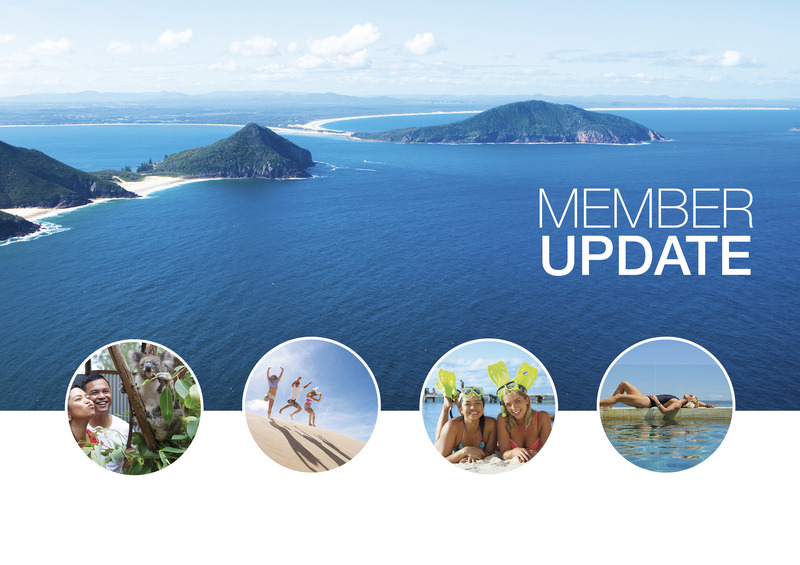 The latest international visitor survey released last week, for the year ending December 2018, has shown a growth in international overnight visitors to Port Stephens by 12% (almost 50,000 international overnight visitors) and international visitor nights by 27%. Key growth markets in terms of international visitors to Port Stephens were China, USA, Germany, Korea, and the UK. In addition to international overnight visitors, Port Stephens also attracts approximately 170,000 international day trip visitors which contribute to growing the visitor economy. The awards offer the opportunity to be recognised as an outstanding tourism operator and raise the profile and reputation of your business. There are 27 submission categories available which showcase the variety of tourism and businesses delivering outstanding service to guests in NSW. In 2018, five NSW Tourism Awards came home to Port Stephens: three gold (Moonshadow TQC, Sand Dune Adventures, and Port Stephens 4WD Tours); a silver (Sand Dune Adventures); and a bronze award (Oakvale Wildlife Park). Great opportunity for Destination Port Stephens members to meet and network with other business people in the local area. Guest speaker is DPS CEO, Eileen Gilliland, who will present on tourism in Port Stephens and how it impacts the local economy. Over 1000 anglers and 400 boats will descend on Port Stephens for one of the largest, family friendly, fishing tournaments in Australia. Read more. A night of fun and entertainment all the while helping raise funds for Camp Quality to support children impacted by cancer and their families. Read more. The annual yachting regatta held in Port Stephens. 8th – 14th April 2019. Take a sneak peek. CLICK HERE. *footage is approved to use in your digital and social platforms. Easter Blues and Brews at Murrays Brewery – 19th to 22nd April 2019 – Have an egg-cellent time over the Easter long weekend at the Port Stephens ‘Easter Blues and Brews festival at Murray’s Brewery’. Kids can join the fun with dedicated activities on Easter Sunday morning. Read more. Cinco de Mayo at Rick Stein at Bannisters – 5th May 2019. Join in the celebration at the Cinco de Mayo take-over at Rick Stein at Bannisters Port Stephens. Feast on favorites from Rick’s latest book “Road to Mexico’ and experience the restaurant like never before – a casual affair, with live music, classic street good and great company. Booking essential. Phone now 02 4919 3800. Read more. King Street Heritage Festival 2019 – 18th May 2019. Step back in time and embrace the past in Raymond Terrace. Dress vintage and enjoy old fashioned activities for all ages. Learn the heritage of the old main street. Read more. Autumn Fair at Hunter Region Botanic Gardens – 26th May 2019. Market stalls, plant sales and fun for the whole family. Explore arts, food, and flavors, antiques, age-old crafts and more. Botanic Gardens website click here. SAVE THE DATE – JUNE LONG WEEKEND. The Blue Water Country Music Festival is bringing the country to the coast from the 8th – 10th June 2019.